One of my least favorite sentences in the entire universe is some version of “It’s always been done this way.” Just by typing it I can feel my blood pressure rise! Why, I wonder, would anyone find that to be a suitable response to any question? In my opinion, it’s not a reasonable explanation for the continuation of any practice. And I find it particularly maddening when it’s used as an excuse – whether spoken aloud or not – for continuing to make children sit still to learn! I imagine that when school was first conceived, the easiest thing to do was simply to have the children seated in rows, with the teacher at the head of the classroom. Mind you, I don’t consider “easy” to be a good-enough reason for much, either. But back then they didn’t have any research upon which to base their decisions. The same cannot be said for today’s decision makers. Today, we know that sitting for more than 10 minutes at a time makes us tired and reduces concentration. We also know – thanks to the work of impassioned educators like Eric Jensen – that honest-to-goodness attention can only be maintained for about 10 minutes or less. So, how could anybody consider sitting for long stretches at a time to be ideal for learning? Additionally, we have increasing evidence that there is a strong connection between physical activity and both optimal brain development and learning. 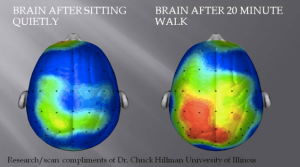 Just look at the illustration below and you can see that physical activity stimulates the brain far more than sitting does. Clearly, the brain on the left is more appropriate for naptime than for acquiring knowledge. But there’s so much more that today’s research tells us. We now know that active learning is far more effective than the kind that involves mere absorption through the eyes, ears, and seat of the pants. There are two stories I’ve come across that help illustrate the significance of active learning. The first is of a preschool teacher who conducted a mock class with parents, in which the lesson was to learn about kiwi fruit. Half of the parents were told about kiwis and then given a coloring sheet, along with brown and green crayons. The other half took a “field trip” to the tree in the hall, where they were able to smell, feel, and taste the fruit. Not surprisingly, the latter group of parents left with a much greater understanding of kiwis. And those were adults who, unlike young children, are quite capable of abstract thinking. The second story is that of a fifth grader who had numerous creative movement experiences outside of school. One day, as his teacher was trying to help her class understand the workings of the human heart via the textbooks open on their desks, the boy raised his hand and asked if they could “do it.” His teacher was puzzled but allowed him to continue, at which point he arranged the children so that some were the arteries opening and closing and others the blood flowing through. Voila! The students understood how the human heart works! Both stories demonstrate the benefits of active learning. Eric Jensen labels this kind of learning implicit – such as learning to ride a bike. At the other end of the continuum is explicit learning – such as being told the capital of Peru. He asks, If you hadn’t ridden a bike in five years, would you still be able to do it? And, If you hadn’t heard the capital of Peru for five years, would you still remember what it was? Explicit learning may get the facts across more quickly than learning through exploration and discovery, but the latter has far more meaning to children and stays with them longer – which goes hand in hand with the research telling us that the more senses we involve in the learning process, the more information we retain. Just because teachers have stood in front of seated children since the beginning of formal schooling is no reason to let the practice continue. After all, no one in the medical field would argue “it’s always been done this way” to defend the continued use of leeches and blood-letting. PreviousPrevious post:Don’t forget the joy! : A call to action for our childrenNextNext post:How best to bust myths that are detrimental to childhood?